You never know what sort of mischief a curious toddler will get into - but you can rest assured mischief will find him (and vice versa) no matter what. 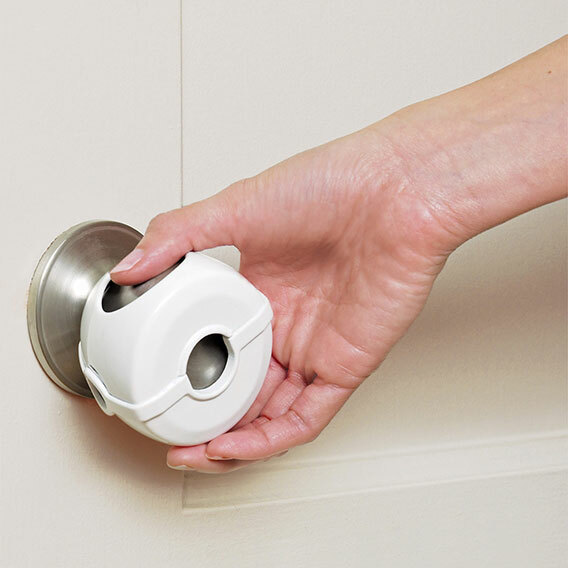 Help prevent children from locking themselves in rooms, or entering and leaving rooms unattended, with childproof Door Knob Covers by Munchkin. The ergonomic design with locking geometry wraps around the entire knob, providing strong tamper resistance. Wide tabs lock the door knob together, requiring both buttons to be depressed to release. To use, simply grab the door knob through the holes in the cover and turn. Get a handle on baby and child safety at home with Munchkin's babyproofing products.